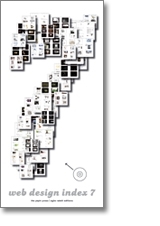 I was browsing through a local Barnes & Noble tonight and found a great book on web design: Web Design Index 7. At first I thought it was some book for web design beginners, but I couldn’t be more wrong. It’s a wonderful book full of screenshots of some very cool web site designs. It seems like a perfect book to inspire your work when designing a completely new site or application. The publisher, The Pepin Press, has more editions of this book, and I’m sure I’ll buy some more after I go through this one. I wish there was a good book on general guidelines for data analytics. Stuff like best practices on how to display historic data, best ways to plot graphs displaying that information, etc. The book Visualizing Data seems interesting, but it’s too bad that it is a book about Processing, a very specific type of data analysis software. Show Me the Numbers is another very good book on this topic, and much more general in teaching some of these concepts. Sometimes I felt it was a bit too academic. Information Dashboard Design is another good book, but it shows off so many examples of bad design when building dashboard modules, that it forgets to also give a few examples of good design. I’ve started working with Flash a bit lately for some features we are adding to Insightory, and I quickly noticed how bad the built-in “Actions” panel in Flash CS3 really is. While watching a video tutorial up on GotoAndLearn.com (highly recommended, by the way! ), I learned about SE|PY, an Actionscript text editor written in pure Python and based on top of Scite. It’s a very good editor, complete with support for multiple open documents in the same window as separate tabs, Actionscript code syntax highlighting, code snippets, file browser and even support for Flash CS3 project files. It’s a perfect replacement for the built-in editor. One other cool thing about Lightview is that it is built on top of Prototype and script.aculo.us, so it might be a very good option for developers already using these popular libraries (like me!). This is something I found out while browsing around. It’s a calendar that you can print out to put in your office, but it lists a bunch of bad usability mistakes. It changes every year, and this is the 2008 edition. You can get your own 2008 calendar for free at BadUsability.com.